In a time when Dresden is undecided on accepting cultural diversity and refugees, and where opinions are clashing, mis-information on the rise, Mic4Peace aims to flip this status quo by giving internationals a stage, a mic, and a voice to change Dresden to the better. The Peace Slam catalyzes discussions through sharing of the others’ perspectives. Story after story, and one insight at a time, it delivers a harmonic thread of constructive discussions driven by listening, promoted by co-existence, and fueled by the dynamism of coming together as a modern society. The International Peace Slam Dresden is a project of MEMORARE PACEM – Association for a Culture of Peace. An initiative of the association MEMORARE PACEM. We are a group of people from variably different fields of work, from different countries, continents and cultures, drawn together in Dresden by science. We started slamming about peace for the International Day of Peace in 2016 – inspired by the topic since then. Would you like to slam about your understanding of peace? Get in touch with us and see where it takes you. Everybody is welcome! Are you interested to host our group for your event in a school, in a theatre or on any event stage? 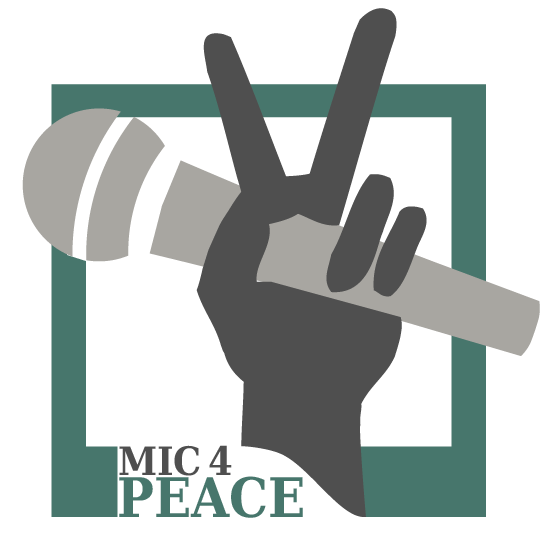 Get in touch with us and experience the peaceful and amusing vibes Mic4Peace will add to your event. Our peace slams can be adapted for kids, but will always (mostly) be in English.